Today many young and dynamic people are looking for part time business. They are either fed up with their full-time job or they want to earn extra money. If you are one of them and looking for part time business ideas this post is for you. 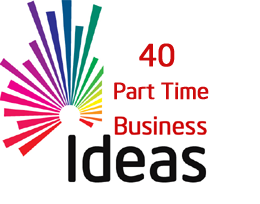 In this post, I will try to give wings to your entrepreneurship by sharing 40 part time business ideas. These part time business ideas are proven and defiantly add a supplement to your income. This is a long post with approximate 1800+ words, so if you wish you can add Moneyexcel.com in favorite or add this post in the bookmark, so that If you cannot complete reading all part time business ideas at a single go you can return to this page again from bookmark. Food-related business ideas are evergreen and can be started and grown in a short period of time. Recommended business ideas for the food are given below. You can start your own part time chocolate making business. A Chocolate making is low investment business. To make chocolate you need raw material such as cream, sugar, mold and decorative items. You need to tie up with a shopping mall or shops to sell your chocolates. If you are good at making a breakfast you can start home based breakfast serving business. Many people look for a place serving good breakfast. This business requires basic setup such as separate room for serving breakfast. Today working women always look for readymade namkeen and snacks. So, starting a part time home based namkeen making is a good choice. You can get runaway success in this business. Food catering is a big business but can be started in part time. This business requires investment. This business also demands good food quality and managerial skills. It requires time to establish yourself in this business. Part-time business can be started online also. Few recommended online business ideas are given below. A blogging is one of the best online part time business. It is proven fact that one can earn a lot of money from blogging. There are numbers of bloggers who are already living their life on blogging. However, it takes a lot of time to make money from blogging. Another part time business is establishing an online store. This idea demands and investment and efforts. You need to buy things at a lower price and sell it at a higher price. Before starting actual online store you can take a trial at Flipkart, Snapdeal, Facebook or Whatsapp. You can earn a lot of money part time from the Affiliate marketing. An affiliate marketing means helping other to sell their item and earn a commission based on a sell. If you are good at social media management you can plan to become social media expert. As a social media expert, you need to manage facebook, twitter and other social pages of a different brand. You will be responsible for increasing likes and shares. You can charge fixed amount for this. This business can be started part time. Many companies seek services from the virtual assistant. Task of a virtual assistant is to help in typing e-mail, project work, data entry or computer related other tasks. There are many websites which offer part time job for the virtual assistant. If you are from IT field with knowledge of website design and SEO you can plan to become website designer or SEO experts. You need to bid online projects and complete the task in given period of time. You can earn a lot of money part time by adopting this business. The part-time business ideas for the service related people are given below. If you are good at repairing computer you can start your own part time repair and computer AMC business. Computer repair business requires a time to establish. Photography is a skill. If you are good at taking a photograph and ready to spend extra time apart from your job this idea is for you. Every small and large business requires a help in keeping account book up to date. If you are from commerce background you can accept the task of account keeping and earn part time income. Interior designer is next in the list of part time business ideas. You can become an interior designer and earn a lot of money. You need to be creative and good at communication, management and planning skills. Errand service is one of the best part time business ideas today. People has become busy today and they need someone to perform a personal task such as making payment of utility bill, delivery of personal belonging etc. If you can effectively manage a team of people you can start errand service business. Insurance agency is low-cost low-risk part time business idea. As an insurance agent, you require quality such as good communication skill, convening power, and knowledge. Income of insurance agent depends on upon a numbers of policy sell, amount, and type of insurance policy. Party decorator makes an arrangement of the decoration in the party (i.e. weddings, themed events, children’s parties). Party decorator specialized in a type of decorations, like balloon decorating or holiday tree lighting etc. If you are good at writing and creating unique content you can start a part-time business of freelance writing. Many online websites are looking for a freelance writer and they are ready to pay a good amount of money for the services offered. The next part-time business idea is resume writing. It is difficult to become resume writer as it requires specific skill and knowledge to become resume writer. Gardening service is a full-time business but at the initial stage, you can start this business part-time. In this business, you need to provide gardening services to companies or individual. You can charge for landscape creation and maintenance. Matchmaking is very good part time business for the women. It is a home based low investment business. You can start your own wedding planning business in part time. This business requires managerial and planning skills. You need manpower support and capital in order to start this business. Tuition class is evergreen, fastest growing and most favorite part time business idea. It is zero investment idea and can be started from home. Today everyone is health conscious and they are ready to spend money on maintaining health and fitness. In order to become a fitness trainer, you need to be physically fit. You also need knowledge about how to maintain fitness level. Starting computer training is a very good part time business idea. In today’s world, everyone needs to know about computers and they are ready to spend money on that. In order to become computer trainer, you require basic infrastructure and knowledge about computers. There is a tradition to give a gift on every occasion and people often get confused while selecting a gift. So, starting a customized gift store could be a very good idea. You can start this business part-time from home and once it is established you can open your own store online or offline. You can start part time business of real estate agent. The investment required for this business is NIL and you can easily start this business from home. However, it will take a time to establish this business and earn good amount of money from it. The next part time business idea is related to seasonal products. India is a country of the festivals and every festival is unique. The festivals give an opportunity to start seasonal product business like selling of firecrackers, kites, colors etc. Custom cloth making is next business idea. If you are creative and knows the skill of designing clothes this idea is for you. You can design exclusive cloths in part time and generate good income. Going for a walk at night time and drinking soda is becoming a trend in many metro cities. So, starting a soda shop in part time could be a very good business idea. This idea is applicable to people with the small land where they can do farming of vegetables. Once these vegetable grows it can be sold in the market. If you are good at a specific subject in business you can become a part-time business consultant. Today many startups are looking for a good business consultant for solving business related problems. Event planning for coordination is next part time business on the list. In order to become event coordinator, you should be extremely good at a managerial and planning skill. It is zero investment business idea. This idea is especially for the women. If you are good at making a food you can plan to become a personal chef. Today many working women prefer personal chef at home for the cooking. Thus becoming a personal chef could be very good way to earn a second income. Disco Jokey is a specialized field. You require a skill and investment in order to start this business. Passion and creativity is important in order to start this business. The next part time business idea is a home repair job. In order to start this business, you need to hire specialized people. ROI for this business is less and it requires time to establish this business. You can plan to start your own business related to pest control in part time. You need to hire labor in order to do pest control. Senior citizen today always needs an assistance in terms of doing small tasks at a home. You can think of doing part time business of supplying manpower to help them. The beauty parlor is a part time business idea for the women. In order to start this business, you need to undergo specialized training. Professional sports coaching is a competitive business. You need to undergo specialized training before becoming a sport coach. It requires determination and commitment to become a sport coach. Readers, hope you liked the part time business ideas mentioned above. What is your opinion about these part time business ideas? Do share your feedback in the comment section. Please tell me how can start photography online business and sale painting art audio. Please send ideas on my mail id. You can either use online free platform for selling your photos and art work or you can establish your own portal for selling photos. idea given in this site is tricky.. But all ideas take to much time for implement.. Give shorterm idea no more longer..
Idea’s you shared need Physical presence always for life time. please tell me any business where i dont need to be physical presence 4-5 years of hard work. Start online business such as blogging and you need not to be present for the life time.